The Royal Swim Plus is a 4-hour program that comes with a 15-minute briefing, 60-minute swim with dolphins, 30-minute swim with sea lions, 30-minute swim with manatees, and a 90-minute catamaran cruise to the world's second largest natural reef. A lunch buffet with two non-alcoholic beverages is also included in the package. The Royal Swim Plus is a 4-hour program in Riviera Maya Puerto Aventuras that gives you a thorough, fulfilling experience swimming with dolphins, sea lions, manatees and cruising on a catamaran along the Caribbean Sea. After your experience with the sea creatures and catamaran ride, you can relax at the Puerto Aventuras facilities. Upon request, you will receive roundtrip transportation from most Riviera Maya hotels to Puerto Aventuras with an additional $16 USD charge for each companion. You will be given a 15-minute briefing at the beginning of the program that teaches you how to interact with the dolphins, sea lions, and manatees. After the orientation, you can jump in the water and spend 60-minutes with the dolphins and 30-minutes each for the manatees and sea lions. During the dolphin swim, you can enjoy a foot push and dorsal tow, which are two different ways of swimming across the water with the dolphins at fun, fast speeds. The foot push includes dolphins thrusting against the soles of your feet to maneuver you across the surface of the water. On the other hand, you can also enjoy the dorsal tow which includes holding onto the dorsal fin of the dolphin as he swims speedily through the water. 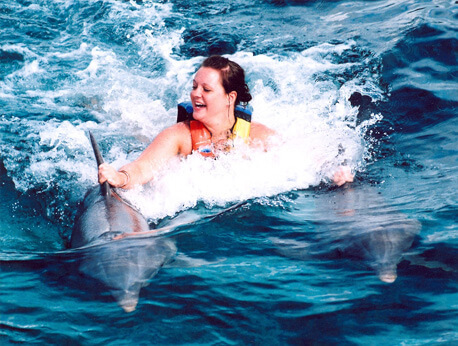 Mellow activities you can delight in with the dolphins include hugs, kisses, hand targeting, and handshakes. Similar to dolphins, sea lions are intelligent, cute, and social animals. During your swim with the sea lions, you will laugh when they give you smacky kisses and show off their silly tricks. Sea lions can also catch balls on their noses, clap, and blow their horns. Despite their large size, manatees are gentle, non-aggressive animals. They move more slowly than dolphins, but they are still fun to interact with. You can receive a manatee kiss that most people find ticklish due to the shape of the manatee's upper lips. As long as weather conditions permit, you will also go on a catamaran cruise during the Royal Swim Plus program. On the catamaran ride, you will venture to the world's second largest natural reef where you have the opportunity to go snorkeling! Snorkeling is really easy to do and learn, so even if it'll be your first time snorkeling, you can participate. With so many fun activities during the Royal Swim Plus experience, you're bound to get hungry. That's why a buffet meal plus two non-alcoholic beverages are included in the package. You will also have access to restrooms, lockers, and showers. In Puerto Aventuras groups have a maximum of 10 people for a closer experience. Kids must be at least 8 years old for the interaction with sea lions.